Landfill leachate is created by rainfall percolating through the waste mass, which releases soluble compounds and elements that are collected at the bottom of the landfill with a properly designed leachate collection system. The composition of leachate depends on the nature and age of the wastes. In this blog, I will discuss landfill leachate from municipal and commercial solid wastes, which are more likely to be of a biodegradable nature. Leachate, or leaching, can be classed as acetogenic or methanogenic depending on the state of degradation of the waste materials in the landfill. 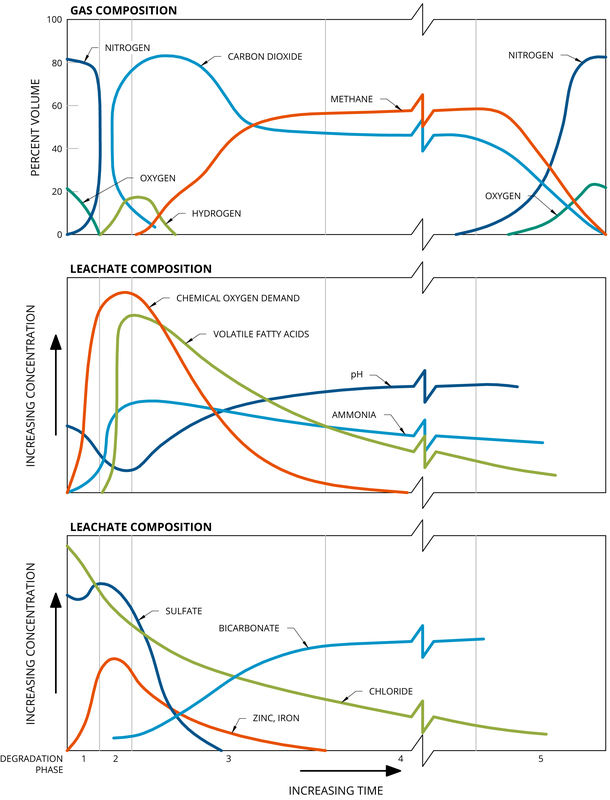 As shown in the graph below, leachate from "young” wastes is characterized by high chemical oxygen demand (COD) and biological oxygen demand (BOD) values (and by high ratios of BOD to COD), low pH and initially high in metals. Methanogenic leachate occurs in older landfills where extensive degradation of organic materials is in the wastes. End products of methanogenesis in the landfill are methane and carbon dioxide. Leachate is categorized by lower COD values, very much lower BOD values, and lower BOD to COD ratios, but ammonia persist and does not readily degrade or “nitrify”. The most expensive operating cost of a modern sanitary landfill is leachate management, disposal and pre-treatment when required. Trucking leachate to a local publicly owned treatment works (POTW) is often the most widely used method of leachate management, but the preferred method, to avoid increasing transportation costs, is direct discharge to an on-site sewer. The POTW also charges a fee per gallon of leachate disposed. In the last several years, however, many of the local POTWs have ceased accepting leachate, especially when the ammonia-N concentrations exceed 500 to 1,000 ppm as they are concerned about toxicity to their biological treatment processes and their National Pollutant Discharge Elimination System (NPDES) permits have lowered Total Nitrogen to 1 ppm. Also, many POTWs have adopted ultra violet (UV) disinfection technologies and a concern is that the amber color of most leachate will absorb the UV light and reduce disinfection effectiveness. When POTWs cease leachate acceptance, the landfill has a choice to truck leachate much farther away to a larger POTW (with multi-million gallons of capacity) or install a pre-treatment system on-site. Most landfills have an average leachate production of about 50,000 gross domestic product (GPD) east of the Mississippi and a larger POTW with dilution is not as concerned about accepting leachate. Leachate treatment technologies fall into two basic types: biological and physical/chemical. In larger systems and depending on the treatment goals, integrated systems that combine the two are often used. Aerobic Biological Treatment such as aerated lagoons and activated sludge. Anaerobic Biological Treatment such as anaerobic lagoons, reactors. Physiochemical treatement such as air stripping, pH adjustment, chemical precipitation, oxidation, and reduction. Coagulation using lime, alum, ferric chloride, and land treatment. Advanced techniques such as carbon absorption, ion exchange, ultrafiltration and reverse osmosis (UF/RO). In some cases, innovative methods have been successful if there is adequate surrounding land to use natural phyto-based systems such as engineered wetlands, hybrid poplar trees (can also be located on top of a closed landfill), wind-aided evaporation, and landfill gas evaporators. Also, if a landfill desires to be independent of a POTW, there are several landfills that treat leachate sufficiently to obtain a NPDES permit for discharge to surface water. Usually a combination of UF/RO after biological treatment is the most optimum method. To determine whether or not pre-treatment of landfill leachate is the most cost-effective solution to manage leachate when the existing method of disposal is disrupted, BBJ can assist landfill owners and operators to select the most cost effective and reliable methods of treating leachate. 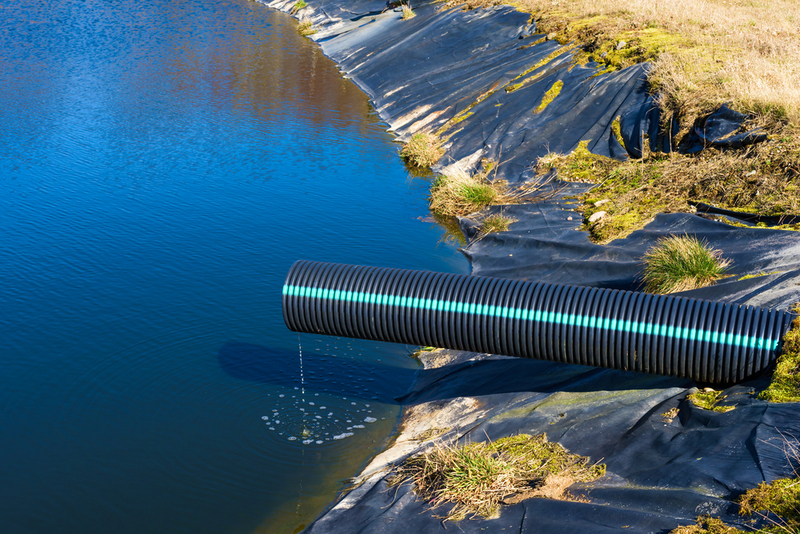 Many engineering firms that have used familiar sanitary engineering treatment processes have failed in the long run due to unanticipated changes in the chemistry of landfill leachate.